On day two the workshop commenced with the introduction by Dr. Bedi of Mr. Luke Waldo who conducted a Marathon half day session on Child Witness to Domestic Violence: How to build resiliency in children who suffer adverse childhood experiences and toxic stress. Which included interactive sessions and later on question and answers. The afternoon session was conducted by Dr. Ashok Bedi. M.D. on Resilience Cultivation in Recovering Addicts – a Neuroscience and Analytical Perspective. Dr. Bedi also demonstrated the latest technology of how one could measure different brain waves onscreen. 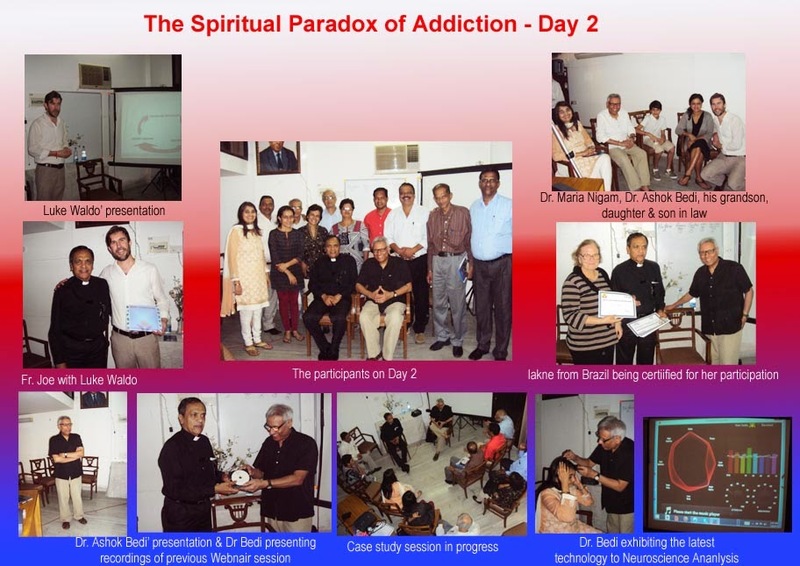 After the sessions Dr. Bedi presented Fr. Joe with a set of 5 recordings of previous sessions of Jungian teachings. Fr. Joe and Dr. Bedi presented each participant with a series of these DVD’s and also a certificate of participants. The workshop ended with on enriched note of knowledge surely empowering the staff to be able to counsel their clients more clinically. Fr. Joe thanked Dr. Bedi and Mrs. Usha Bedi for their valuable time and knowledge spent h Kripa. Fr. Joe also thanked Mr and Mrs. Luke Waldo and their children for being with us and especially Luke for teaching us new dimensions in how to build resiliency in children who suffer adverse childhood experiences and toxic stress.